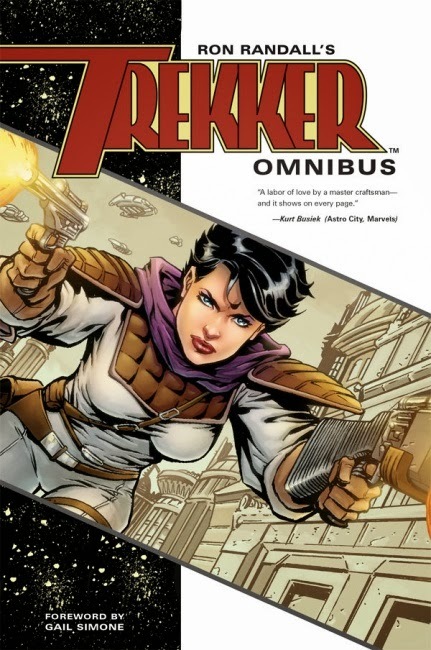 Ron Randall's Trekker returns in an omnibus edition, and it's a good thing to have as like many creator owned comics originating in the 80s the series bounced around a bit from being a feature in another series or changing publisher as was the case with other series like Grimjack, Usagi Yojimbo, or Groo. This volume pulls the Trekker stories from Dark Horse Presents Vol. 1 4-6, 20-22, and 39-41, Trekker 1-6, Trekker Color Special, and A Decade of Dark Horse #2, from Dark Horse as well as Trekker #1 from Image Comics. In addition to that is over 60 pages of new color material featuring both new story material and chapter/story break illustrations. Other goodies include a profile on Trekker creator Ron Randall, a sketchbook section displaying various pencil pages, designs, promotional pages and the like, as well as a foreword by Gail Simone (writer of Batgirl , Birds of Prey, and Secret Six). All of that together allows this omnibus edition to clock in at some 300 plus pages. But what is Trekker you ask? One answer is in the world of Trekker, a trekker is a bounty hunter sanctioned by the government to supplement the underfunded police. Another is the adventures of Mercy St. Clair, the title character of the series. While yet another answer is sci-fi noir. Sci-fi noir? Sure, detectives, bounty hunters, hit-men, mobsters, smugglers, crooked politicians, and spaceships! Imagine Grimjack without the fantasy elements or Judge Dredd with out the dark humor/satire and you kind of get the feel. Or possibly think of something like Firefly. On to the adventures of Mercy St. Clair. Noir and sci-fi action fans will have plenty to enjoy as Mercy goes through a series of adventures pitting her against adversaries ranging from mobsters to hit-men to corrupt politicians to outlaw killers to smugglers to terrorists as well as against the police and even other trekkers. Many with the requisite henchmen of course. That's not to say it's all action, action, and more action. Randall includes many character and drama driven scenes with Mercy interacting with characters such as her closest friend, boyfriend, mentor Angus, and Uncle Alex (who as a police lieutenant provides an even more interesting dynamic at times as a result)in addition to scenes with her pet Scuf which allow for reminisces about Mercy's past. And speaking of past, yes, we do get an origin story as tragedy in Mercy's past is hinted at along with the road to her becoming a Trekker which is revealed later on in the volume. Those various adventures take Mercy to a variety of locales. What would noir stories be without seedy bars or the docks? Or even shadier alleyways? Abandoned tunnels, swamps, deserts, spaceports, as well as any other locales her hometown of New Gelaph can throw at her. Some of the stories collected in the omnibus are in color while others are in black and white. This is simply how they were produced as some were black and white comics while others were color. While some might prefer all one or the other, I honestly think the color stories look best as they are while the black and white stories have the proper tone to them to look how they should as is. 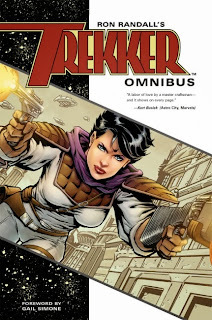 If you want to try a series with a strong female lead, give Trekker a shot. If you want to try some sci-fi comics, give Trekker a shot. Or if you just want to read some comics with good art and a good story (which is all a comic needs), give Trekker a shot. Just be careful that Mercy doesn't shoot back! I agree with Gail Simone's P.S. : "More Trekker, please."